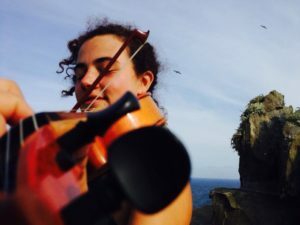 Mary Fraser began her musical life by training in classical violin for thirteen years, concluding with a Suzuki method violin teacher certification. She then left the classical music world and traveled extensively throughout the UK, immersing in the traditional music of her heritage. Carrying right on into the southern US states to study the old time fiddle styles of eastern Kentucky, West Virginia and North Carolina. She now lives and teaches fiddle in western Massachusetts, also running a business weaving baskets. You can find her playing in the fields and woods, cozy New England living rooms, rowdy small town pubs and in Grange halls for squaredances.